The James Bean Store is situated on the west side of Main Street’s north end business district in the Village of Blackville. Built circa the 1890’s, it is a one-and-half storey commercial storefront, vernacular in design with Classical elements. 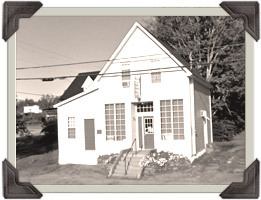 James Bean Store is designated a Local Historic Place for its association with local merchants James Bean and his wife, Jane MacRae. MacRae, a descendant of a longstanding name in the Village of Blackville, along with her first husband James Bean, operated this storefront under his name for several decades. Her matriarchal qualities and her astute business resulted in the establishment of a compliment of influential properties within the family merchant business trade. In 1944, Roy MacRae purchased the storefront and, along with Walter MacRae, operated W. A. & R. L. MacRae, offering delivery service to the rural area. The latter remained in business here for five decades. The storefront has remained occupied by the MacRae family.